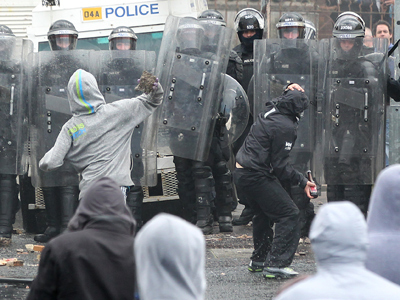 Twenty-nine policemen were injured during disorder in east Belfast on Saturday. Day 40 of the flag protests saw officers firing plastic bullets and using water cannon in response to hundreds of protesters' attacks with bricks, bottles and fireworks. The unrest on Saturday began at about 14:30 GMT, with clashes between loyalists and nationalists in the city center. 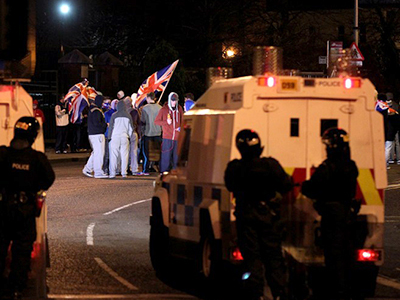 The trouble erupted, as loyalists returned from a demonstration at city hall. Police intervened to separate the crowds. Despite being under attack from bricks, bottles and fireworks, the officers managed to move the loyalist crowd back, though they had to use four plastic bullets. There were also reports of a viable explosive device, which was found in Donegall Avenue during a security alert in south Belfast. Army bomb disposal officers were called to the scene and they have taken it away for further examination. “Today we’ve seen photographs issued by both sides claiming each other caused today’s outbreak of violence. But if nationalists do get drawn into the whirlwind, it could get much worse. Also an explosive device, small but viable, was found on the train line in Belfast. It’s not yet clear who planted that, but these are not good signs,” journalist for The Christian Science Monitor, Jason Walsh, told RT. 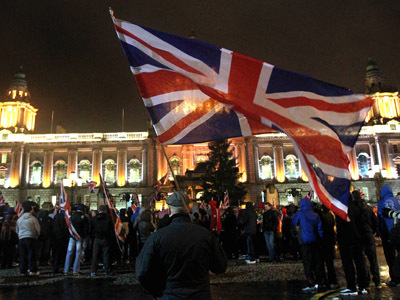 In the early hours of Saturday morning nearly 1,000 people took part in the flag protest at Belfast City Hall. Over a hundred protesters attacked police, throwing petrol bombs and blocking roads across Belfast. Two dozen roads were blocked at rush hour on Friday night, bringing traffic to a halt. As demonstrators threw stones and rocks, police used mobile water cannons and plastic bullets to try and quell the protest. 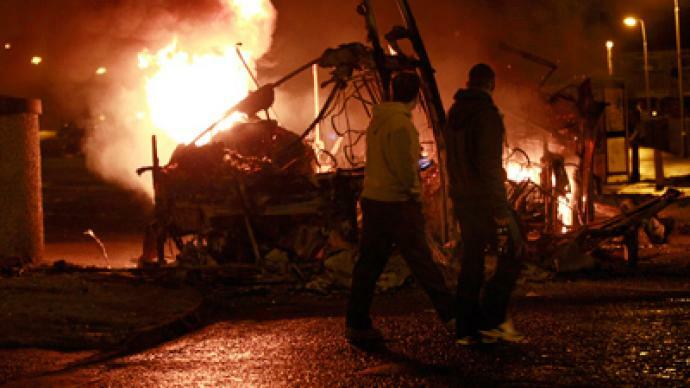 Demonstrators also torched a bus in Belfast, and a car was set alight. "Twenty nine police officers were injured with four officers requiring hospital treatment. Two officers have been discharged and two remain in hospital," Police Service of Northern Ireland said in a statment. All in all, during the six weeks of protests, dozens of police officers have been injured and more than 100 people arrested. "The situation being faced by the police is intolerable and in keeping order on our streets and bringing people before the courts the PSNI [the Police Service of Northern Ireland] must have the full support of all who want to see an end to this violence," Presbyterian Moderator Dr. Roy Patton pointed out to The Irish Times. In the meantime, senior politicians from Belfast, Dublin and London are to meet next week to discuss the protests. “There’s no doubt that the proximate cause of the unrest is the flag, but at this point we’ve had six weeks [of unrest], so it’s difficult to believe, that the flag alone is the cause. There are a lot of talks about economic issues and recreational rioting, but it’s really difficult to say, because the protests have no open leadership. 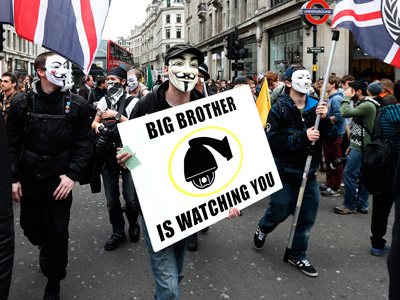 No one is entirely sure exactly what it is that the protestors want,” added Walsh. Meanwhile, an online campaign amid the protests urged people to stage “sit-ins” against the violent rallies – in cafes, pubs, and restaurants, to give businesses hit by the demonstration, a boost. On December 3, Catholic council members voted to lower the British flag from the city hall except from 18 official days each year. Since then, Belfast has been engulfed by rallies that have at times turned violent. Friday’s demonstrations were mainly peaceful, with only two suburbs, Newtownabbey and Carrickfergus, bearing witness to violence. The pro-British loyalists that are taking to the streets, largely see the council's decision to curb the flying of the flag as an attack on their identity and a concession to Republicans, who are seeking a united Ireland.